Nine years after it first cut a dash and subsequently established itself as a modern-day Audi design icon, the all-new Audi A5 Coupé has undergone both a technological transformation and an artfully crafted styling evolution that brings it absolutely up to date and introduces a fresh, contemporary look while still retaining the graceful presence and elegant character of the original. Its beautifully flowing bodywork has been aerodynamically optimised to deliver a drag coefficient of just 0.25, while beneath the skin is a new platform that reduces weight by up to 60kg over its predecessor. 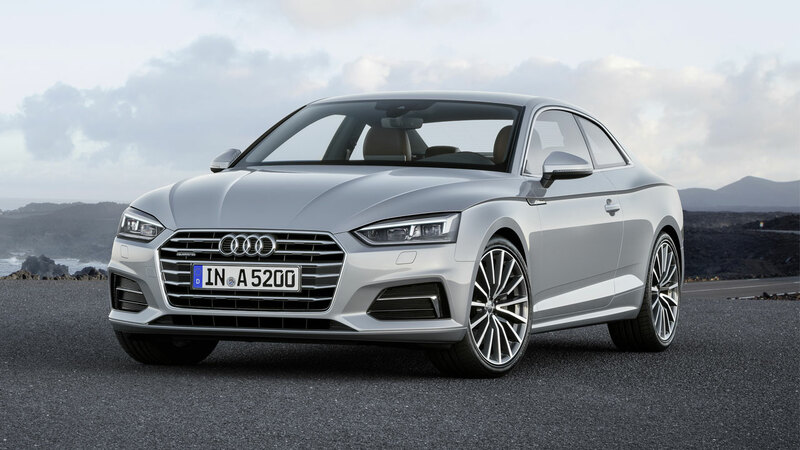 A range of powerful TDI and TFSI engines and an even more advanced suite of infotainment and driver assistance systems that are at the cutting edge of Vorsprung durch Technik also converge on thenew Audi A5 Coupé. The new Audi A5 Coupé sports a modern and honed look. It is nevertheless true to its DNA with the dynamic and elegant character being passed down to the new version. The best example is the wave-shaped shoulder line that already characterised the previous model. The precisely sweeping line with pronounced bulges over the wheel arches emphasises all four wheels – a cue to the quattro all-wheel drive. The perfectly balanced proportions that comprise the long bonnet, the stretched wheelbase and short overhangs underscore the muscular presence of the new A5 Coupé. The sculpted Singleframe grille is significantly flatter and wider than in the previous model. The LED rear lights and optional LED or Matrix LED headlights with dynamic turn signals make high-end technology visible even after dark. The Audi A5 Coupé is significantly more efficient than its predecessor. This is due in large part to a reduction in weight and a design that goes hand in hand with sophisticated aerodynamics. The engineers were able to trim kerb weight by as much as 60 kilograms. The body is the lightest in the competitive field thanks to an intelligent mix of materials and lightweight design. With a drag coefficient of 0.25, the A5 Coupé is also the segment leader with respect to aerodynamics. The new Audi A5 Coupé will launch in the UK with five engines: two TFSI and three TDI units. Their power output has increased considerably and is now between 190PS and 286PS. Compared with the previous model, they offer up to 17 percent more performance while consuming as much as 22 percent less fuel. All of the engines combine high efficiency with impressive power and smooth running – especially the two 3.0 TDI six-cylinder engines. 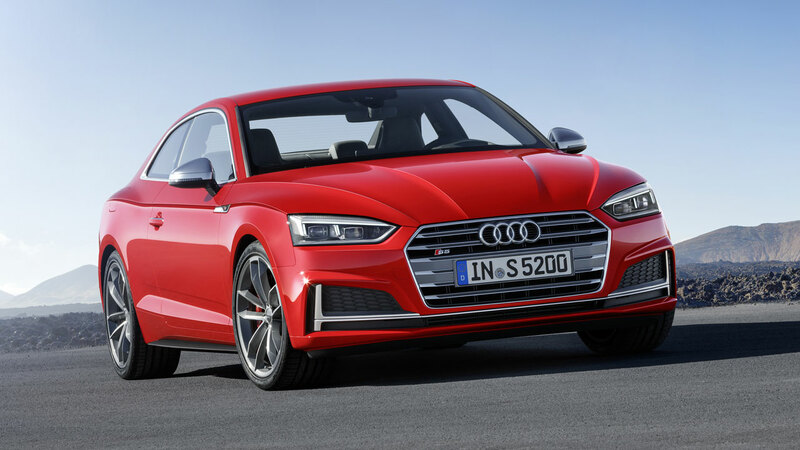 With its newly developed 3.0 TFSI, the Audi S5 Coupé is now in a league of its own. The turbo V6 exhibits highly efficient, sports car performance. From its 2,995 cc of displacement, the boosted six-cylinder engine produces 354PS of power, which is 21PS more than the engine in the previous model. The new Audi A5 Coupé comes with a drivetrain solution tailor-made for each engine variant. The manual six-speed gearbox and the seven-speed S tronic are used with the four-cylinder engines as well as the 218PS 3.0 TDI with front- or all-wheel drive. The eight-speed tiptronic is reserved for the top diesel with 286PS and the S5 engine. Both engines come standard with quattro all-wheel drive. Audi also offers the optional rear-axle sport differential for even more dynamic driving and precision. The new quattro with ultra technology, which debuted on the new Audi A4 allroad quattro 2.0 TFSI, is also available on the Audi A5 Coupé. At the moment it can be combined with the four-cylinder TFSI and TDI engines with manual transmission. Optimised for efficiency, the drive system does not exhibit any perceptible differences to permanent systems in terms of traction and driving dynamics. The all-new chassis is among the strengths of the Audi A5 Coupé. It offers the driver optimal comfort combined with a high degree of agility. The A5 thus handles narrow, winding mountain roads and long trips on the motorway with equal aplomb. Audi offers a suspension with damper control as an option. This is integrated into the dynamic handling system known as Audi drive select, which enables the driver to modify the basic characteristic in multiple steps. A new electromechanical power steering setup adapts according to the vehicle’s current speed and provides highly precise road feedback. Optionally available is the dynamic steering, which varies its gear ratio depending on the speed and steering angle. As is typical for Audi, interior build quality is uncompromisingly high. High-quality materials in a wide range of colours provide for a particularly pleasant ambiance and underscore the premium character of the mid-sized model. Optional ambient lighting highlights the interior with a choice of 30 adjustable shades. The new A5 Coupé also redefines the class benchmark for aeroacoustics. The acoustic comfort is almost that of a luxury class model. The luggage compartment offers a volume of 465 litres, 10 litres more than with the previous model. The rear seat has a 40:20:40 split and can be easily folded forward using levers in the luggage compartment. Audi also offers the two-door coupé with optional gesture control for opening the luggage compartment lid via a foot motion. The optional trailer hitch is electrically released at the press of a button. When Audi connect is specified, a separate SIM card is permanently installed in the car with a flat rate data plan. The new Audi A5 Coupé uses this to connect to the Internet via the ultrafast LTE network. Use of the versatile Audi connect services is complimentary for three months, and can be extended via a subscription beyond this period. The respective national provider is selected automatically as needed in most European countries as needed, eliminating roaming charges when driving abroad. The A5 will also be available with the Audi connect safety & service package. This includes such functions as an automatic emergency call in the event of an accident, online roadside assistance and Audi service request as well as remote functions that can be used with the MMI connect app on a smartphone, smartwatch or – in conjunction with the fourth generation Apple TV – from a television. Examples include locking and unlocking the car, checking where the car is parked and calling up the vehicle status. With the standard Audi smartphone interface, Apple Car Play and Android Auto bring the familiar smartphone environment to the car, if desired. The optional Audi phone box with wireless charging in the centre armrest uses near-field coupling to link smartphones wirelessly to the vehicle’s antenna and enables inductive charging according to the Qi standard. For very discerning hi-fi fans, the Bang & Olufsen sound system with its innovative 3D sound is available as an option. The predictive efficiency assistant helps the driver save fuel, Audi active lane assist helps keep the car on track in the driving lane, and the Stop&Go adaptive cruise control including traffic jam assist offers the driver relief in slow-moving traffic. New and important safety features include the park assist, cross traffic assist rear, exit warning, collision avoidance assist and turn assist as well as the Audi pre sense systems. Camera-based recognition of traffic signs rounds out the lineup. 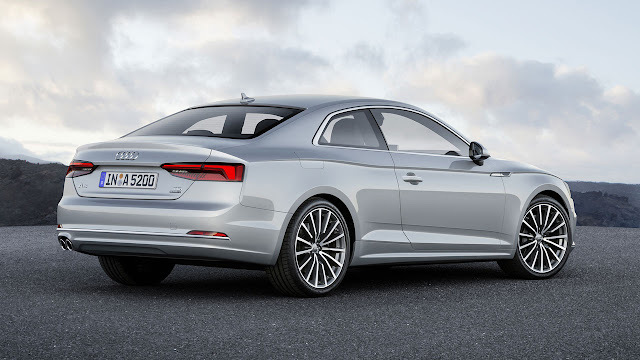 The new Audi A5 Coupé will launch in the UK in winter 2016. Compared with the previous model, the list of standard equipment is even more generous. Among the features included are xenon headlights with LED daytime running lights and LED rear lights, LED interior lights, the Audi MMI radio plus with 7-inch MMI colour display, Bluetooth and USB charging function, the three-spoke multifunction steering wheel (including shift paddles in models with automatic transmission), height-adjustable belt feeds, the Audi drive select dynamic handling system and Audi pre sense city. 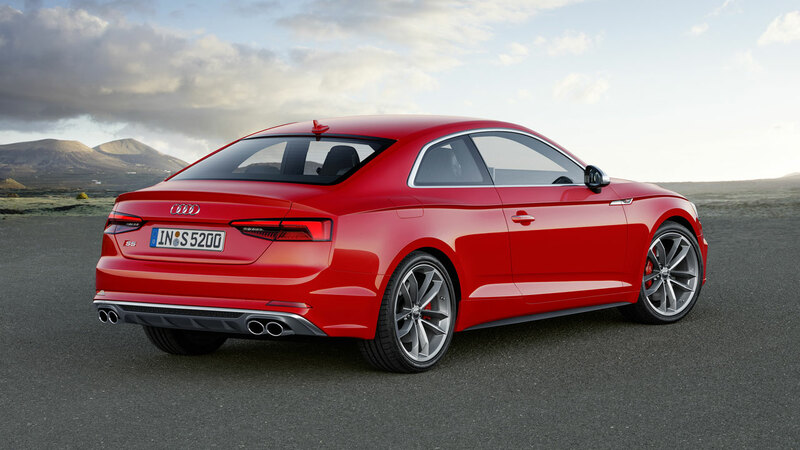 The new Audi S5 Coupé combines dramatic elegance with the performance of a sports car. Its newly developed, turbocharged V6 engine produces 354PS and is capable of 62mph from rest in 4.7 seconds. The sharper S exterior design and the S-specific details in the interior underscore the dynamic character of the Audi two-door sports coupé. For further information about the Audi A5 and Audi S5 Coupé visit the online magazine “Audi A5 illustrated” at www.audi-illustrated.com/en/audi-a5-s5.